The de Blasio administration is taking big banks to court over their failure to clean up a cluster of abandoned houses as the distressed properties wind their way through snails-pace foreclosure proceedings. Chris Glorioso reports. The de Blasio administration is taking big banks to court over their failure to clean up a cluster of abandoned houses as the distressed properties wind their way through snails-pace foreclosure proceedings. The city's Department of Housing Preservation and Development filed lawsuits Wednesday against two lenders and three mortgage servicing companies, alleging the financial firms have persistently shirked their responsibility to secure five abandoned homes in Brooklyn. New York State's 2016 "Zombie Home" law requires banks and their subcontractors to periodically inspect houses going through foreclosure -- and if residents have bailed out -- take over the cost of property maintenance. "Our goal is to get these banks to take accountability for these properties," said HPD Deputy Commissioner Leila Bozorg. 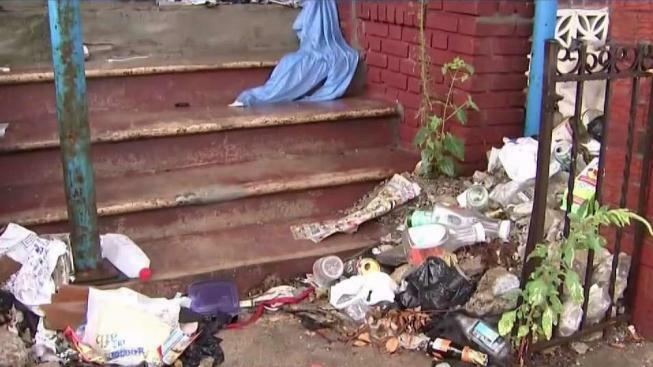 One of the zombie homes targeted by the legal action is 1889 Bergen Street in Brownsville, where I-Team cameras spotted waist-high weeds sprouting from a mound of garbage on the front porch. Nearby, a condom and a crushed malt liquor can lay on the front steps. According to the HPD lawsuit, CitiMortgage and its servicing company should have cleaned the property up months ago. "My mother actually did call the bank about it and they repeatedly said they’re going to do something about it, said Geoffrey James, who lives next door. "It's been years and nothing has been done." A spokesman for Citi declined to comment on the blighted property, citing the city's pending litigation. In another zombie home lawsuit, the city claims Wells Fargo failed to secure a Crown Heights property at 1831 Park Place. Yet another lawsuit alleges one of Wells Fargo’s mortgage servicers, a company called Ocwen, neglected a zombie home at 31 Essex Street in Brooklyn’s Highland Park neighborhood. Marco Lopez, a 31-year-old who lives next door to that dilapidated house, says it has been notorious for squatters and drug activity. The I-Team has reached out to the FDNY to see if there is any record of the drug overdose, but as of this article's publication, there was no word back. Kevin Friedlander, a spokesman for Wells Fargo, said he could not comment specifically on the lawsuits because he hadn’t yet seen them. But he did say Wells Fargo "does not have ownership" of 31 Essex Street and directed the I-Team to speak with Ocwen, the loan servicer assigned to the property. "We work diligently to manage vacant properties for which we are responsible and in a manner that benefits the community," Friedlander wrote in an emailed statement. "This includes registering vacant properties as required by local ordinances and resolving any violations, fines or fees." John Lovallo, a spokesman for Ocwen, said the loan servicing firm is conducting a thorough review of 31 Essex Street, but stressed the lawsuit against his company "involves a single property in Brooklyn, NY." According to HPD, New York’s zombie home law designates both lenders and their servicers as responsible parties for the safety and security of properties in foreclosure. "We have our surveys and the photos and our work with the law department of the city of New York to prove that we don’t think they’re in compliance," Bozorg said. In all, the city is demanding lenders and their servicing companies pay more than $1 million in fines and reimbursements for repairs the city has already made to try and keep the zombie homes safe. The state's zombie home law calls for up to a $500 penalty for each day an abandoned foreclosure fails to meet safety and environmental health standards. The city expects to file more zombie home lawsuits against lenders and their subcontractors in the months to come.